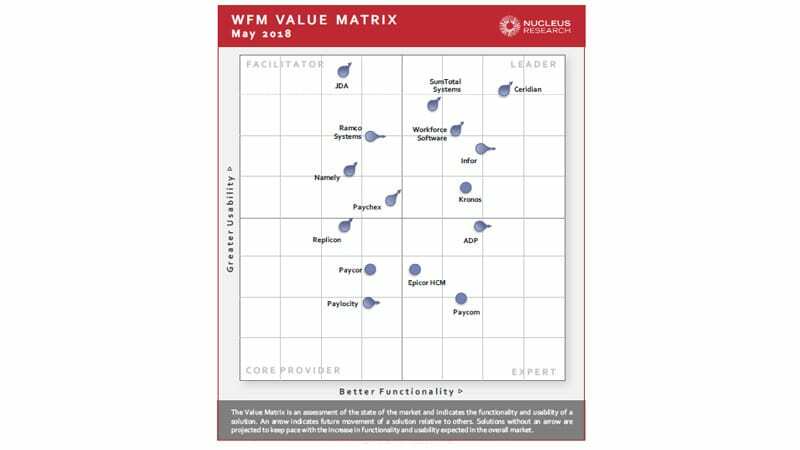 Nucleus Research just published their Workforce Management Technology Value Matrix 2018. For the second year in a row, Nucleus positioned SumTotal Workforce Management in the Leader quadrant. I’m also happy to say that as a reflection of all our continued innovation and commitment to our customers, SumTotal moved further to the right, reinforcing and solidifying our position in the market. While I could happily go on espousing all the wonderful ways the SumTotal WFM solution deserves this recognition, I think it best if we hear what Nucleus Research, independent industry analysts, have to say. As noted in the report, we are the only vendor in the market with out-of-the-box functionality that validates an employee’s training and certification requirements when they are being scheduled. This unique capability gives organizations the assurance that only those employees correctly trained and certified for the position are scheduled, mitigating risk and ensuring compliance. To learn just how crucial this is, and why it is so important, I recommend checking out the Mitigate Your Risk by Validating Employee Training and Certification webinar. Nucleus also called out our “flexibility and nimbleness in handling complex scheduling and benefits management for wage employees.” SumTotal’s WFM solution is designed so that we can assist organizations with managing and administering very complex rules and requirements, especially those found in union environments, and in particular if there many collective bargaining agreements (CBAs) in place. One customer we work with has over 100 different CBAs, each one with additional degrees of intricacy. At the end of the day, it is still best when you hear that the people you work for are happy. So, I was delighted to read in the report that “Nucleus’s analysis of users finds them highly satisfied with their SumTotal WFM deployments overall.” As a vendor in a highly complex workforce management market, it is easy to deliver innovation, but it is much harder to achieve high marks for customer satisfaction. It is very satisfying to hear this and know that our customers are confident and putting their trust in SumTotal to manage their time & attendance, scheduling, and absence management requirements. Also, I would like to thank the SumTotal Workforce Management team, our Customer Support, Professional Services, Cloud Operations, Engineering, Product Management, Sales teams and all others who not only deliver service and support to a world-class solution but also make our customer’s satisfaction their top priority. Well done! Read more about why SumTotal is a Leader by downloading a complimentary copy of Nucleus Research’s Workforce Management Technology Value Matrix 2018 report. Then, learn out more about SumTotal Workforce Management and how our solution can help you better manage your workforce with time & attendance, scheduling and absence management!